The Inn of the Sixth Happiness 六福客栈 (UK,USA,1958) - 英语电影角 - 英语交流吧论坛 - Powered by Discuz! 预告片 trailers: A good mix of scenes from the movie---in the original English dialogue with Chinese subtitles---and thoughtful Chinese commentary, is at: http://v.youku.com/v_show/id_XNTAwMDY2MTg0.html . The whole film, with the original English soundtrack and Chinese subtitles, is uploaded at http://www.letv.com/ptv/vplay/1077596.html . An early scene in a version of the movie dubbed in Mandarin is uploaded at: http://www.tudou.com/oplay/pSvR3B-09Rs/QejBU8UtO64.html and http://v.youku.com/v_show/id_XNTAxMTQyOTI=.html. The Inn of the Sixth Happiness is a 1958 American 20th Century Fox film based on the true story of Gladys Aylward, a tenacious British maid, who became a missionary in China during the tumultuous years leading up to World War II. Directed by Mark Robson, who received an Academy Award for Directing nomination, the film stars Ingrid Bergman as Aylward and Curt Jürgens as her love interest, Colonel Lin Nan, a Chinese officer with a Dutch father. Robert Donat, who played the mandarin of the town in which Aylward lived, died before the film was released. The musical score was composed and conducted by Malcolm Arnold. The cinematography was by Freddie Young. The film was shot in Britain. Snowdonia in North Wales was used for exterior locations. Most of the children in the film were Chinese children from Liverpool, which has one of the oldest Chinese communities in Europe. The film was the second most popular movie at the British box office in 1959. The film makers, since release, have been criticised for casting Ingrid Bergman, a tall woman with a Swedish accent, as Gladys Aylward, who was in fact short and had a cockney accent. Likewise, the two leads, British actor Robert Donat and Austrian actor Curt Jurgens were not even Chinese. Overlong but fairly engrossing bio of Gladys Aylward, an English-woman who, despite her lack of qualifications, becomes a missionary in China. The film is episodic and covers Aylward's brief career as a parlor maid (saving money for her trip to China), her journey to China, her work at the Inn of the Sixth Happiness and the Chinese-Japanese war which results in her guiding 100+ children in an arduous journey through the mountains to a safer village. I didn't find the film as moving as other reviewers but it is well mounted and nice to look at. Bergman is outstanding as are other supporting players, most notably Curt Jergens and Robert Donat. This was Donat's last film (he died before it was released) and his last screen words are prophetic - "We shall not see each other again, I think. Farewell." What is most notable about this dvd release is the excellent commentary by Nick Redman, Aubrey Solomon and Donald Spoto. Redman talks about the real Gladys Aylward, Solomon talks about the film production and Spoto discusses Ingrid Bergman. There were many things changed for the film version and many of them are small and inexplicable. For example, Aylward's given Chinese name was Ai-weh-deh (not Jenai), an adopted child was actually named Ninepence (Sixpense in the movie), etc. Other changes were more larger in scope - Aylward's journey to China was quite harsh and she almost died several times. The inn-keeper, Jeanne Lawson (memorably played by Athene Seyler) was no as agreeable a woman as portrayed in the film - she was actually a cantankerous person prone to fits and thought to be quite mad by the villagers. Aylward herself was thought by many to be fanatical and to put it bluntly, off her rocker. Many other fascinating aspects about the film and the women (both Aylward and Bergman) are included. The story begins with Aylward (Ingrid Bergman) being rejected as a potential missionary to China because of her lack of education. Dr. Robinson (Moultrie Kelsall), the senior missionary, feels sorry for her and secures her a position in the home of a veteran explorer with contacts in China. Over the next few months, Aylward saves her money to purchase a ticket on the Trans-Siberian railway, choosing the more dangerous overland route to the East because it is less expensive. Once in China, she settles in the town of Yang Cheng, where she secures a post as assistant to a veteran missionary, Jeannie Lawson (Athene Seyler), who has set up an inn for traveling merchants, where they can get a hot meal and hear stories from the Bible. The film follows Aylward's acculturation, culminating in her taking over the inn when Lawson dies in an accident. The local mandarin (Robert Donat) appoints Aylward, a stubborn but endearing woman, as his Foot Inspector to ensure that the ancient practice of foot binding is eradicated in the region he governs. She succeeds in this, and manages to put down a prison revolt as well, winning her the esteem of the local population as well as of the mandarin. Meanwhile, however, China is being invaded by Japan, and Aylward is encouraged by Lin to leave. She refuses, and as the town of Yang Cheng comes under attack, she finds that she has fifty orphans in her care. As the population prepares to evacuate the town, the mandarin announces that he is converting to Christianity to honour Aylward and her work (she is rather taken aback by this, as she would have preferred him to convert through religious conviction.) She is now left alone with the children, aided by Li (Burt Kwouk), the former leader of the prison revolt that she helped to resolve . Lin tells her that the only hope for safety is to take the children to the next province, where trucks will drive them to safety, but they must get there within three weeks, or else the trucks will leave without them. Just as they are preparing to leave, another fifty orphans appear from a neighbouring town, so Aylward and Li have no choice but to lead one hundred children on a trek across the countryside. Although it should only have taken them a week, the roads are infested with Japanese patrols, and the group has no choice but to cut across the mountains. After a long, difficult journey, they all arrive safely (except for Li, who died to save them from a Japanese patrol) on the day the trucks are to leave. Aylward is greeted by Dr. Robinson, whom she reminds how he rejected her as a missionary years before. The film was based on the book The Small Woman (1957), by Alan Burgess. The real Gladys Aylward (1902–1970) was born in London. She was a former domestic turned missionary in China and best known for her work with children. Aylward became a Chinese citizen in 1936. Four years later, despite being in ill health herself, she led more than 100 children over the mountains to safety at the height of the Second Sino-Japanese War. In 1958, the year this film was released, she founded a children's home in Taiwan, which she continued to run until her death. Known in China as "Ai-weh-deh", or "Virtuous One", she continues to be regarded as a national heroine. Gladys Aylward was deeply upset by the inaccuracy of the movie. Although she found herself a figure of international interest thanks to the popularity of the movie and television and media interviews, Aylward was mortified by her depiction in the film and the many liberties it took. The tall, Swedish Ingrid Bergman was inconsistent with Aylward's small stature, dark hair and cockney accent. The struggles of Aylward and her family to effect her initial trip to China were skipped over in favor of a plot device of an employer "condescending to write to 'his old friend' Jeannie Lawson," and Aylward's dangerous, complicated travels across Russia and China were reduced to "a few rude soldiers," after which "Hollywood's train delivered her neatly to Tsientsin." Many characters and places' names were changed, even when their names had significant meanings, such as those of her adopted children and of her inn, named for the Chinese belief in the number 8 as an auspicious number. Colonel Linnan was portrayed as half-European, a change which she found insulting to his Chinese lineage, and she felt her reputation damaged by the Hollywood-embellished love scenes in the film; not only had she never kissed any man, but also the film's ending portrayed her character abandoning the orphans in order to join the colonel elsewhere even though in reality she did not retire from working with orphans until she was sixty years old. In real life, Gladys and Lin Nan were not reunited - he was lost in the war and she never knew what happened to him. 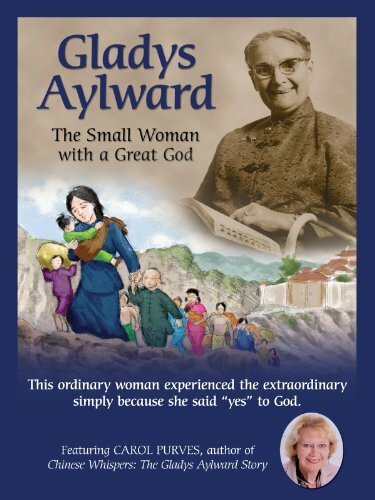 Gladys May Aylward (24 February 1902 – 3 January 1970) was a British evangelical Christian missionary to China whose story was told in the book The Small Woman by Alan Burgess, published in 1957. In 1958, the story was made into the Hollywood film The Inn of the Sixth Happiness, starring Ingrid Bergman. Aylward was born of a working class family in Edmonton in east London in 1902. Her parents were Thomas John Aylward and Rodina Florence Aylward (nee Whiskin). Her siblings were Laurence, and Violet. Although she became a domestic worker (housemaid) at an early age, she always had an ambition to go overseas as a missionary, and studied with great determination in order to be fitted for the role, only to be turned down because her academic background was inadequate and the China Inland Mission to which she applied was convinced that it was not possible to learn the language at her age. Her determination was such that, in 1932, she spent her life savings on a passage to Yangcheng, Shanxi Province, China. The perilous trip took her across Siberia, where she was forced to get off her train and find an alternate mode of transportation. She returned to Britain in 1948 where, after 10 years, she sought to return to China; she was denied re-entry by the Communist government and instead settled in Taiwan in 1958. There she founded the Gladys Aylward Orphanage, where she worked until her death in 1970. A film based on her life, The Inn of the Sixth Happiness, was released in 1958. It drew from the book The Small Woman by Alan Burgess. Although she found herself a figure of international interest thanks to the popularity of the film and television and media interviews, Aylward was mortified by her depiction in the film and the many liberties it took. The tall, Swedish Ingrid Bergman was inconsistent with Aylward's small stature, dark hair and cockney accent. The struggles of Aylward and her family to effect her initial trip to China were skipped over in favour of a plot device of an employer "condescending to write to 'his old friend' Jeannie Lawson," and Aylward's dangerous, complicated travels across Russia and China were reduced to "a few rude soldiers," after which "Hollywood's train delivered her neatly to Tsientsin." Many characters and place names were changed, even when these names had significant meaning, such as those of her adopted children and of the inn, named for the Chinese belief in the number 8 as being auspicious. Colonel Linnan was portrayed as half-European, a change which she found insulting to his real Chinese lineage, and she felt her reputation damaged by the Hollywood-embellished love scenes in the film. Not only had she never kissed a man, but the film's ending portrayed her character leaving the orphans in order to re-join the colonel elsewhere even though in reality she did not retire from working with orphans until she was sixty years old. Aylward died on 3 January 1970 just short of her 68th birthday, and is buried in a small cemetery on the campus of Christ's College in Guandu, New Taipei, Taiwan. She was known to the Chinese as 艾偉德 (&Agrave;i Wěi Dé- a Chinese approximation to 'Aylward' - meaning 'Virtuous One'). Shortly after her death, an Edmonton secondary school formerly known as Weir Hall was renamed Gladys Aylward School in her honour. Numerous books, short stories and films have been created about the life and work of Gladys Aylward (listed below). Wellman, Sam (1998). Gladys Aylward: Missionary in China. Barbour. 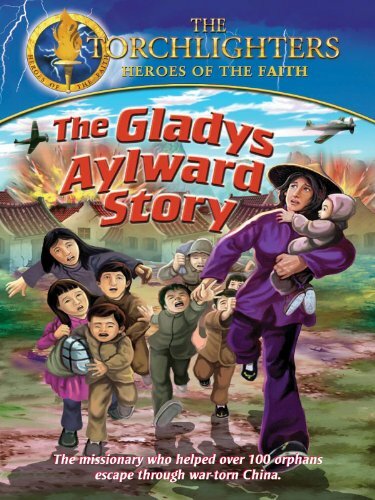 Torchlighters: The Gladys Aylward Story (2008) - animated DVD for children ages 8–12. GMT+8, 2019-4-23 06:49 , Processed in 0.180634 second(s), 31 queries .